The first book covers key events in the early history of the Church and is available beginning today, Tuesday, September 4, 2018. The four-volume narrative history, titled “Saints: The Story of the Church of Jesus Christ in the Latter Days,” features authentic stories about the pioneers who established the Church around the globe. “On behalf of the First Presidency and the Quorum of the Twelve Apostles, we express appreciation to the scores of people who have made this narrative history possible,” said Elder Quentin L. Cook of the Quorum of the Twelve Apostles at a news conference in the Church History Library in Salt Lake City. “While the history includes exciting rushes of revelation that affect the whole Church, some of the most interesting aspects are the individual stories of faithful members,” said Elder Dale G. Renlund of the Quorum of the Twelve Apostles. When all four volumes are complete, they will cover a period of early Church history from before the First Vision to the present day. The Church historian hopes the new series will appeal to younger readers. “With ‘Saints,’ we hope to reach a worldwide audience of Church members with a focus on speaking to those the scriptures refer to as the rising generation,” he explained. The first volume of “Saints,” subtitled “The Standard of Truth,” tells the story of the Restoration, beginning in 1815 with Joseph Smith’s childhood, and concludes with Latter-day Saints worshipping in the Nauvoo Temple in 1846 before their exodus west. Church historians researched and wrote each volume under the direction of the First Presidency. “Our teams include historians charged with finding the best sources and understanding the best context, creative writers tasked with making the narrative engaging and editors who work to ensure that the book is accessible for our audience,” said Grow. The English print book is available in Church Distribution and retail outlets. The printed Church publication will be available in the following 14 languages by the end of the year: Cebuano, Chinese, English, French, German, Italian, Japanese, Korean, Portuguese, Russian, Samoan, Spanish, Tagalog and Tongan. Readers can also find the free content in 14 languages on the Church History website and in the Church History section of the Gospel Library app. In addition, seven chapters of the first volume are published in the Church’s “Ensign” and “Liahona” magazines. The audiobook is currently available in English, Portuguese and Spanish. Joseph Smith commissioned and oversaw the writing of the first multivolume Church history in the 1830s, which was published beginning in 1842. The second history was published in 1930 by Church historian B. H. Roberts, before Church membership had reached 1 million. Today, the Church has more than 16 million members worldwide. They live in 188 countries, nations and territories and speak many languages. The 586-page volume is divided into 46 easy-to-read chapters. 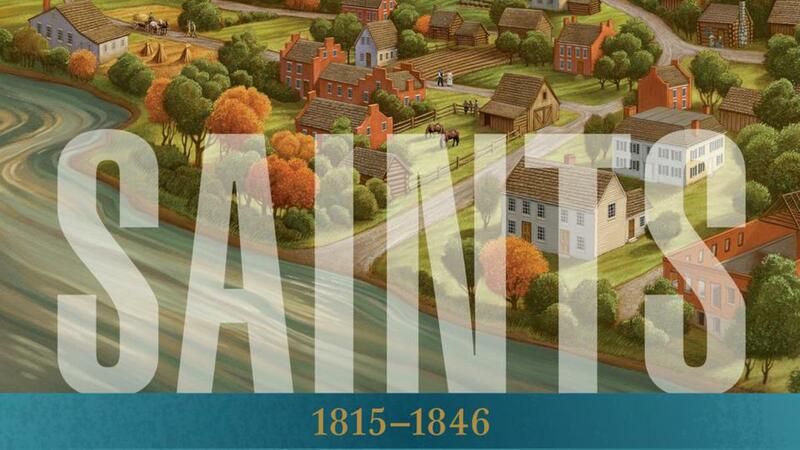 “Saints,” an official history of the Church, includes the latest historical research with some sources that weren’t available when the older books were published. Volume two of “Saints,” subtitled “No Unhallowed Hand,” covers the Saints’ challenges in gathering to the western United States, ending with the dedication of the Salt Lake Temple in 1893. Volume three, “Boldly, Nobly, and Independent,” focuses on the global growth of the Church and concludes with the dedication of the temple in Bern, Switzerland, in 1955. The fourth volume, “Sounded in Every Ear,” brings readers to the recent past with temples located all over the world. Written in a narrative style, the four-volume collection is designed to appeal to youth and adult readers. The content is supported by historical sources. Readers will find notes in the back of the book to refer to Church records and additional resources, including supplementary essays and videos. “We encourage you to read it, trusting that it will assist you in understanding God’s plan, seeing how merciful the Lord has been, enduring faithfully in good times and bad, gaining Christlike empathy for others, and keeping the covenants leading you to exaltation,” said Elder Cook at the June devotional. For more information, visit saints.lds.org.